Disclaimer: I am not a doctor, nutritionist or medical professional in any way. I am also not affiliated with or an expert on FASTer Way to Fat Loss. This is just a reflection and summary of my own personal experience and is not to be taken as medical advice or professional guidance. You've asked for it and today is the day I'm finally sharing my experience with FASTer Way to Fat Loss. I'm just a few days away from completing my first six week round and knew I couldn't hold ya'll off for another second, so I'm hitting publish and sharing my progress pics to boot. Settle in, this is a long one, but I wanted to make sure that I hit all of the FAQ's that have landed in my in box! If I missed one, drop it in the comments and I'll tackle it for you! Also, let me take a moment to say that all bodies are good bodies. Mine has been through 3 pregnancies, one miscarriage, pre-term labor and 2 c sections in the past 4ish years. I was proud of it in the before pics and am proud of it in the after pics. Why did you start FWTFL? I have been an online Weight Watchers kind of girl (read more about that journey here) on and off for the last few years. Once we were settled from our move to Charlotte, I really got serious and followed the program, seeing a loss on the scale. By the time Fall rolled around (so, maybe six months or so) I had plateaued and couldn't seem to drop more than a few ounces at each weekly weigh in. I thought FWTFL would be a great way to shake things up, maybe break through the plateau and give myself a break from the scale. It does. The fee for your first round of FWTFL, which is six weeks plus one "learning week" is $199. The fee provides you with your coach (the absolute most important aspect), the online portal to resources and an online community. You also need the My Fitness Pal app which has a free and a premium version. Do you need special food? Nope. I didn't change what I was eating at all - Chick Fil A, wine, pizza night, I just had to be more thoughtful about when I ate them. Most of the recipes I made were from my coach Kristen, SkinnyTaste or suggestions from the group. Is there room to mess up? There is. I "messed up" regularly because life happens. No one kicked me out or yelled at me or told me that I'd blown it. In fact, I went on vacation to Disney during my round and didn't even think about a macro the entire time I was there. I came home, hopped right back on the wagon and didn't look back. The overall vibe of FWTFL is that this is a lifestyle and not a diet and so there will be days/times when life gives you Churros at Cinderella's Castle and you'd be a fool to pass them up. I think because FWTFL is a non-scale program, there isn't really the sense that you've had a "bad week" or that you've gotten "off track". You aren't weighing in every 7 days to track your progress, you're marking your progress in non-scale wins, which takes a lot of pressure off. It's an eating plan that focuses on the macro nutrients of your diet - specifically fat, carbs and protein. Each individual has a specific target of carbs, fats and protein to eat each day, personalized based on your current height/weight and overall goals. The goal is to eat during an "eating window" following an intermittent fasting schedule that prevents late night snacking and causes you to be conscious of when you choose to eat during the day and to carb cycle, which includes eating a higher amount of carbs some days of the week and lower amounts on the other so that your body learns to burn fat. It sounds overwhelming at first, but honestly, it's very doable. I still start my day with coffee, so that's always a promising start. Well, it wasn't hard for me so much as it was just plain different than how I was used to eating/tracking my meals. It took me about two full weeks to really get into a rhythm and understand/trust the process but after that, things became much more second nature. Do you have to work out? Nope. I didn't work out routinely on Weight Watchers so I wanted to do a fair comparison and decided not to do the workouts. You can work out, FWTFL provides you with a work out plan that can be done anywhere - or you can continue your own work out plan with your rest days lined up to meet the appropriate eating days. I chose not to and am still really happy with my progress. Ok, so, let's talk about the whole coach aspect. Admittedly, I am not a joiner. I have always chosen to do Weight Watchers online because the idea of going to meetings is a little much for me. I wasn't sure about the whole coach aspect but I can assure I would have been completely lost in this process if it wasn't for my coach Kristen. She invited me to join her first group as a Coach and I'm afraid she got more than she bargained for. She literally had to hold my hand for the first three weeks. Like, she had to set up my app for me (it's not hard, I just couldn't seem to get it), she had to assure me that I was "doing it right", that I should have been eating all of the food I was, that I should be thinking of carbs as a good thing, etc. I had a lot of learning to do to sort of wrap my brain around the differences between FWTFL and WW and she never gave up on me. Each Coach (who goes through a fairly extensive interview and then learning process prior to taking on participants) sets up their own private Facebook group for each round of FWTFL, so for the seven weeks that you are in the program, your groups constantly checks in, shares recipes, shopping tips, non-scale wins and support. The check-ins have kept me accountable and Kristen has been nothing but supportive for each of us. Some coaches support a non-dairy, non-gluten aspect of the FWTFL program but that is not the version of the program that either Kristen or I recommend. I need a program that is long term and sustainable and leaving out entire food groups is just too restrictive for me personally. Um, no. I eat significantly more food on FWTFL than I ever have on WW or any other plan. Honestly, I'm never hungry, you don't have to give up anything, replace any meals or anything crazy. Most days, I'm needing to snag something after dinner to make sure I hit all of my goals - it's been an eye opening experience for me, to say the least. Do you have to weigh in/share your current weight/actual weight loss? 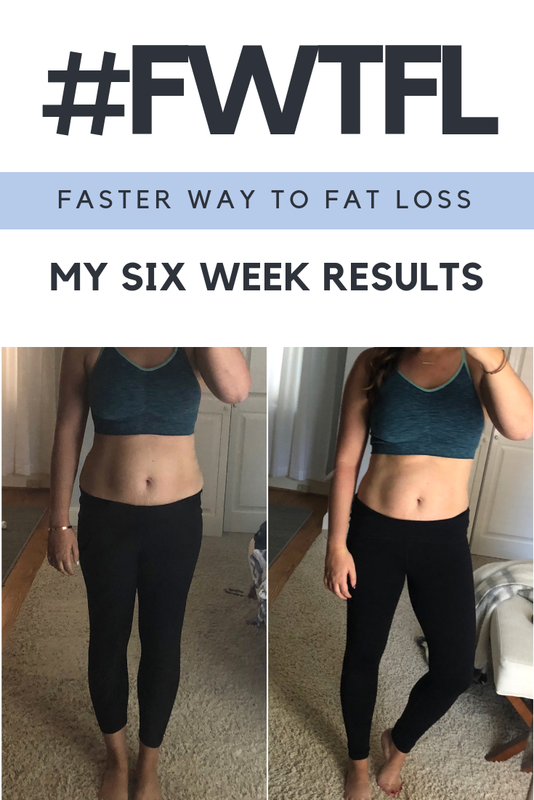 FWTFL is a non-scale program which means there is zero weighing in and instead, you take before and progress photos and measure your success by loose clothes and your energy levels. I can say that the break from the scale has been a huge relief for me. I didn't realize how scale dependent I had become on Weight Watchers (to their credit, they are working on changing that aspect of their program) - I would look in the mirror and think that I looked great, step on the scale and be disappointed in my weight and then look back in the mirror and change my mind about how I looked. I did weigh myself around the one week mark on FWTFL but haven't since - and I don't plan to, because I'm honestly happy with how my clothes fit and what I see in my photos. Weeks 1-3, I probably would have said "definitely not" but now that we're on week 5, I really do plan to keep doing FWTFL. I love staying off the scale, I've gotten into a rhythm as far as the carb cycling, I think it's very attainable to achieve in my day to day life and I am really proud of my progress. So, how much weight have you lost? I don't know! 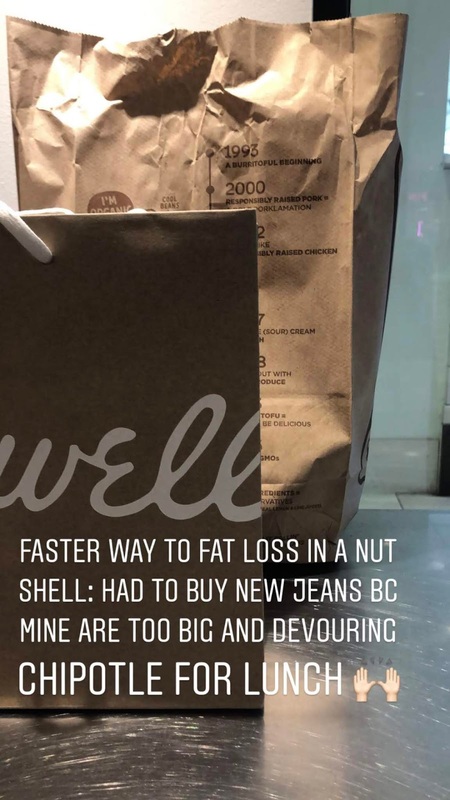 I have gone down a jean size in Madewell jeans and two pant sizes in Old Navy. I'm down a top size and my chest is smaller. My mid section seems to have a different shape, slimmer around the love handle section and at my natural waist. I'm also sleeping really well at night which means I'm feeling better during the day with less exhaustion fueled anxiety. In my opinion, yes - my group is made up of men and women, all ages, all activity levels, all knowledge levels, all walks of life. You can sign up with my coach, Kristen Mills, here (affiliate link). Each six week round has an official start date and they begin on a rotating basis. Ok, want to see my Before and During pics?? Part of me is dying a little that I'm posting these shots but a larger part of me is crazy proud of my progress, so shield your eyes if you aren't into seeing my midsection. Because there was so much interest in this post, I went ahead and published during week 5, so I still technically have another full week to go, but this is my current change and I honestly can't believe it. I'll sit down and write another post directly comparing Weight Watchers to FWTFL soon so leave any questions in the comments and I'll be sure to include them in my next post! Already signed up?? Perfect! Read this post on how to plan, prep and survive the first few weeks! Congrats! You look great! Have never heard of this program, but will look into it for sure. Thanks for your honesty, humor, and encouragement! This was super informative!! Do you lose access to the group instructions and exercises when your six weeks is up? I'm so intrigued by this! Do you know if it's okay to do while breastfeeding? My daughter will be 5 months next week and I'm ready to get back into my old clothes! Is there another group after the holidays? Yes, you can do it while breastfeeding! Congrats!!! I want to do this program SO badly!! Maybe one day. You look awesome! So a few questions...what do you do after the 6 weeks? I was with noom and lost 15 pounds but got bored with it and am looking for something else. I do not have a whole lot of time as I have 5 chilren and am busy but this looks doable! I would love your thoughts.